Caption: BestCo Foods president Dino Scopelleti (left) and son and vice-president Vincent examine the high-quality pack seal created by the model VC999 RS420c rollstock thermoformer. Life may sometimes seem a grind to some folks, but for one Quebec-based meat processor, grinding massive cuts of raw meat down to shreds is a beautiful way to make a living. Based in Terrebonne, Que., Les Aliments BestCo Foods is a family-owned and operated business specializing in mincing and grinding of various types of meats for the retail and institutional sectors within the province and throughout the rest of Canada. 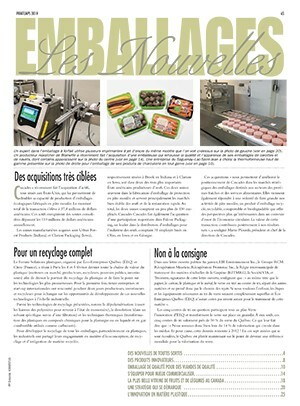 “We are a production facility, not a distributor, supplying distributors who do not have the necessary specialized equipment or access to a HACCP (Hazard Analysis and Critical Control Points) facility dedicated to food safety,” BestCo president Dino Scopelleti explained to Canadian Packaging magazine in a recent interview. Although situated within a large 30,000-square-foot facility, Scopelleti and his 10 employees run the busy operation out of a compact rented 5,000 square-foot space that he has turned into a Gold-classified operation inspected annually by the GFTC (Guelph Food Technology Centre). “Dealing with meat and poultry, we are fully cognizant of the health and safety issues our customers and their customers face,” states Scopelleti. 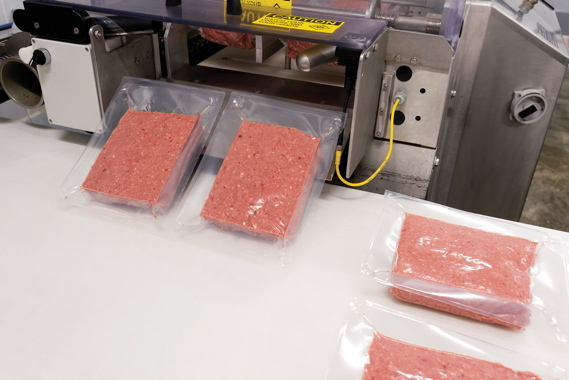 Processed and packed for industrial sale, packs of ground meats exit a VC999 RS420c thermoformer that has helped BestCo Foods achieve notable reductions in packaging time and costs. Started up in March of 2000, BestCo Foods initially had a different vision than what currently exists, acknowledges Scopelleti. “I started the company with the intention of producing a high volume of fresh and frozen kebobs. “I did that for a few years, and had good success with it,” Scopelleti recalls. Seeking to avoid the seasonal ups and downs of capacity, in 2004 Scopelleti decided to shift BestCo’s focus to specialize in producing ground meats and other different products for foodservice distributors as the core customer base. “It meant reinventing ourselves, but doing so provided my company and our employees with a much more stabilized yearly production,” he notes. Nowadays BestCo Foods produces and packs about 30 different products, with about 60 per cent of its production being minced (ground) or cubed products, including beef, veal, pork, lamb and chicken, and has at times produced marinated duck breast and roasts for a key customer. “Our production is split between processing and packaging for distributors and cooking facilities, like those that make different sauces,” Scopelleti relates. 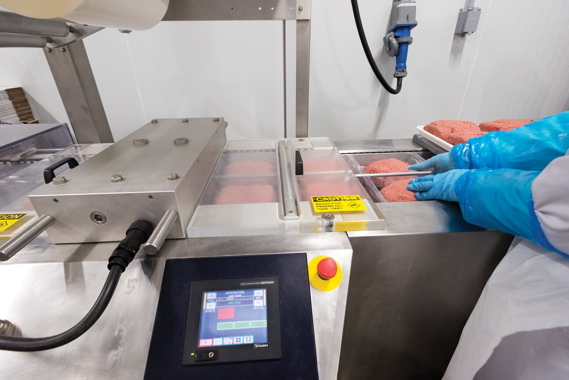 A BestCo Foods employee manually places precise portions of meat into the VC999 RS420c thermoformer, which can process over 960 units per hour. The model RS420c rollstock thermoformer manufactured by VC999 provides a high level of product protection and hygienic cleanliness for the BestCo Foods plant. Over an eight-hour daily shift, BestCo produces between eight to 10,000 kilograms of product, which in 2014 added up to volumes of 550,000 kilograms of minced meats, as well as 50,000 kilos of lamb and 20,000 kilograms of duck products and more. By meat type, production of BestCo Foods breaks down to: 40 per cent beef; 20 per cent pork; 20 per cent lamb; 10 per cent duck; five per cent apiece for veal and chicken. Scopelleti says he is not bothered in the slightest by the inherent anonymity of his line of work. 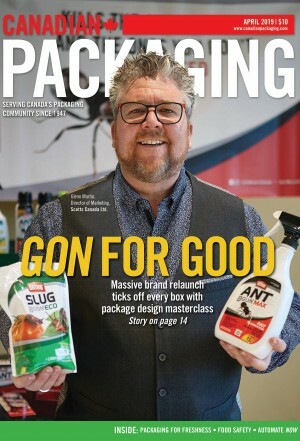 With about 60 per cent of the product processed and packaged by BestCo destined for hospitals, schools, hotels and restaurants, the remaining 40 per cent of output is supplied to the retail sector. “About 12 years ago, BestCo Foods began processing products for the renowned Knowlton, Que.-based duck meat specialists Brome Lake Ducks (Canard Du Lac Brome),” recalls Scopelleti. 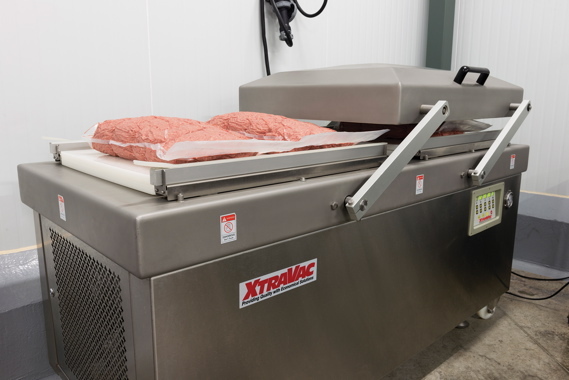 The XtraVac CM640 double-chamber vacuum packing machine from VC999 is used by BestCo to package portioned meat products weighing up to 30 kilograms in weight. Scopelleti’s son Vincent joined the business in 2013 as both partner and vice-president, around the same time as the company moved into its current facility, which enabled it to essentially double its production output. Proud papa Dino adds that thanks to the work of Vincent, BestCo will probably double its grinding capacity in the very near future. “Right now, we are in the last stages of achieving our Halal certification,” points out Scopelleti. “We always work closely with our customers in the research-and-development of new products, while also offering them personalized packaging. “Attaining the Halal-certification will open up brand new growth opportunities for BestCo,” he enthuses. Despite still being a relatively ‘small’ company in terms of volumes, Scopelleti says that maintaining a high degree of flexibility for changing customer needs is both a priority and a competitive advantage. 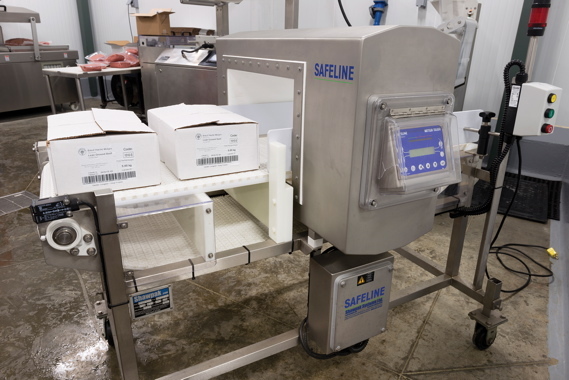 To ensure optimal food safety compliance, BestCo Foods uses a Mettler-Toledo Safeline metal detection system, distributed in Canada by Shawpak Systems Ltd. Helping BestCo achieve that flexibility on a consistent basis is VC999, a Switzerland-headquartered global designer and manufacturer of vacuum chamber machines, thermoform (rollstock) packaging machines, tray-sealers, skin packaging, and flowwrappers, as well as related robotics, vision inspection systems, conveyor/converger systems, weighing, labeling and product scanning machinery. 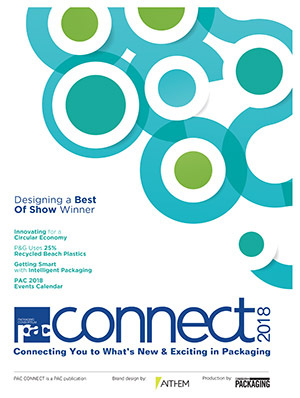 After assessing BestCo’s production needs, VC999 supplied it with a full packaging solution, featuring a RS420c compact rollstock thermoformer and a XtraVac CM640 double-chamber vacuum machine. According to Scopelleti, BestCo Foods first began working with VC999 in 2008, when it purchased the RS420c thermoformer, adding different types of tooling since then to provide it with new packaging options. 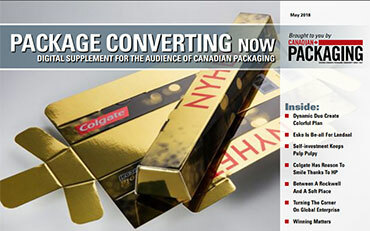 Cloutier says the rs-Series thermoform packaging machines produce precision deep-drawn packages from plastic high-barrier films, while the XtraVac CM640 uses FlexOStar vacuum pouches supplied by XtraPlast Packaging Materials, a VC999 sister-company. “With the ease of changeover we get from the thermoformer, we can pack product anywhere from 300 grams to five kilos,” notes Scopelleti, adding that the only product packaged in trays are the duck roasts it does for Brome Lake. 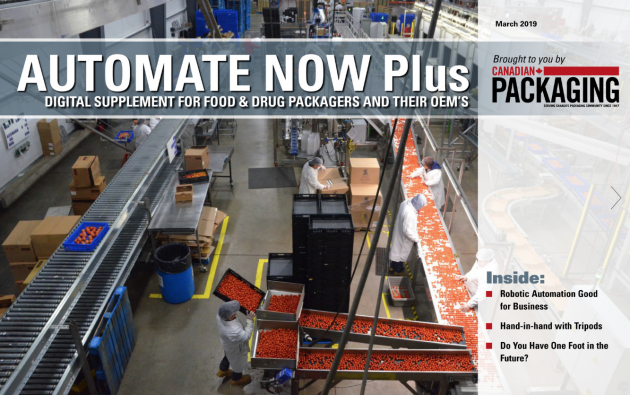 “We run it to its full capacity every day, packaging more than 960 packages per hour,” he extols. Scopelleti says the RS420c provides BestCo a maximized shelf-life for fresh products, delivering a value-added package presentation while also providing a high level of product protection and hygienic cleanliness. • Free lifetime technical support. “It hardly seems necessary considering its robustness,” opines Scopelleti, but after having grown fond the RS420c, when the time came to expand in 2014, he got in touch with VC999 again, purchasing a double-chamber XtraVac CM640 vacuum packing machine to package portioned product up to 30-kilos in weight. Compact in design, the economical XtraVac CM640 is considered ideal for small- to medium-sized production runs, but providing excellent product shelf-life and a handsome product presentation. 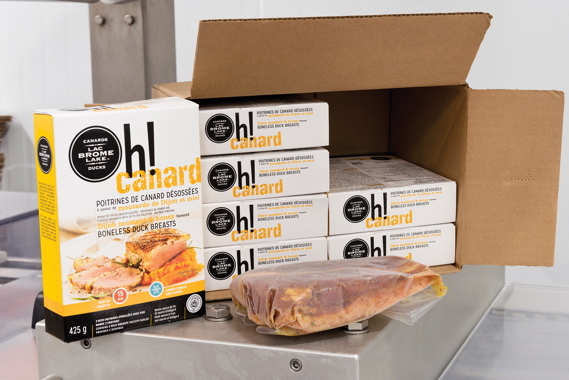 BestCo Foods uses its VC999 XtraVac CM640 double-chamber vacuum-packing machine to create the inner pack of the premium-quality Dijon mustard and honey-flavored boneless duck breasts on behalf of its retail customer Brome Lake Ducks. “From the moment it was delivered, the VC999 team was here helping us program the machine to our specifications,” he relates. “And, should we require any additional information, we’re confident help is just a phone call away,” says an impressed Scopelleti adding that VC999 has an excellent preventative maintenance program to support its equipment. Adds Cloutier: “We have a preventative maintenance service program for their machine, which helps explain why their operating costs are so low. 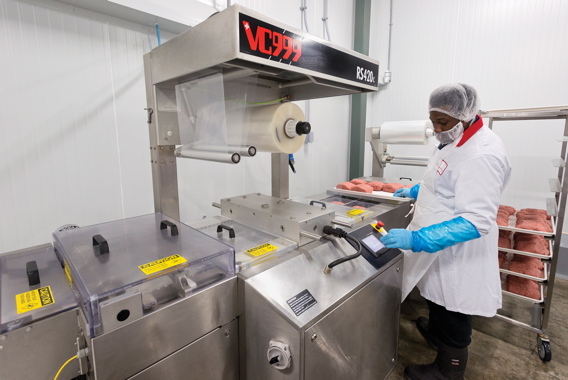 VC999 also supplies BestCo with quality XtraPlast film, that enables the thermoformer and the vacuum-packing chamber machines to achieve superior forms and seals, virtually eliminating the meat processor’s concerns about package rejects. Scopelleti is also quick to extend special praise to Bertoldi’s, a Montreal-headquartered equipment supplier specializing in industrial knives and cutting machinery. “With Bertoldi’s, we purchased and set up a meat grinding line where we run a pair of Biro AFMG industrial grinders, helping us output 2,000 kilograms of meat per hour,” explains Scopelleti. He adds that BestCo also recently purchased a 2501CE Hydrauflaker—combination flaker and slicer—from the Sheboygan, Wis.-based GMC (General Machinery Corporation), enabling BestCo to flake over 3,000 kg of meats per hour. Scopelleti relates that the equipment supplier performs weekly maintenance, and the sharpening of all the blades and grinding plates. Other equipment used by BestCo to create their packages include Protec DDC 9600 and Zebra printers, which take care of all the thermal heat label requirements, producing durable labels containing clearly etched lot code data for easy traceability. “The processing and packing services provided by BestCo are superb, and I am cognizant of the fact that along with the wonderful work provided by my employees, the equipment we’ve purchased from companies like Bertoldi and VC999 are key to the positive reputation we have enjoyed in the industry,” sums up Scopelleti.